President Lex Muir was presented with a new chain of office by Secretary Dominic Frame. 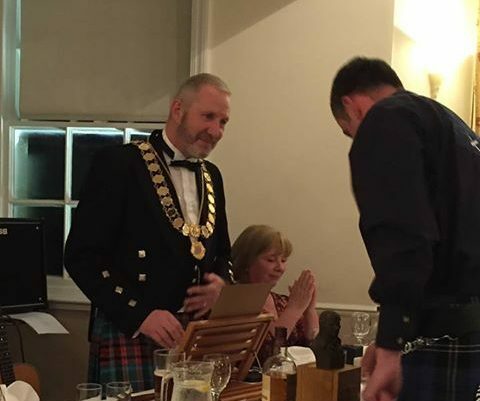 Newton Stewart Burns Club held their 10th anniversary Burns Supper on 25 January 2019. The Club was formed on The Bard’s 250th birthday, and so it was apt that this celebration should also fall on the day of Robert Burns’ birth. The home of the Club and venue for the night was Creebridge House Hotel, where the largest ever attendance of 82 were given a fantastic night’s entertainment. The top table consisted of the first five members to be admitted to The Club in 2009. Immediately after his welcoming comments, President Lex Muir was presented with a new chain of office by Secretary Dominic Frame. This was a complete surprise to Lex, who was shocked and delighted in equal measure at this wonderful display of confidence in the Club by the Committee. Young Katie Cloy from Creetown Primary School entertained the crowd with a fantastic recitation of ‘Address to the Toothache’ which had everyone holding their jaws in sympathy. Alistair Hairstens, still tired from the previous nights Haggis Hunt, piped in the beast which was presented to John Cuthbertson, who then addressed it with vigour and not a few wild slashes of the knife. Darren Andrews delivered the Selkirk Grace following which a wonderful traditional meal was served by the very efficient staff of Creebridge House. After a short break, Club Treasurer Martin Emerson played his guitar and sang ‘A Man’s A Man’ to the great delight of the crowd. This was a perfect introduction to The Immortal Memory which was then delivered by Mrs Una Wilson of Kirkmabreck Farm, Carsluith. Una’s very informative and inspiring speech touched on many aspects of Burns’ life, but particularly on his influence on Maya Angelou, the American poet, singer and civil rights activist, as well as his very positive effect on the life of American slave Frederick Douglass. Martin then performed what is surely one of Burns’ most beautiful songs ‘Ae Fond Kiss’ after which Club President and Chairman for the night, Lex Muir, recited ‘The Holy Fair’ – a not often heard piece which gives a great insight into life during the Bard’s time. Dominic Frame delivered an amusing Toast to the Lassies which was ably replied to by Fiona Jessiman – both very funny and entertaining speeches. As the night drew near its close Ian Petrie gave his usual hilarious Vote of Thanks to great hilarity and not a few red faces, setting the company up for a rousing ’Auld Lang Syne’ to bring the formal part of the night to a close. The company were then entertained by David Kerr on the accordion to continue the fantastic night in customary fashion. Newton Stewart Burns Club are very appreciative of the support shown by members and friends of the Club during its first ten years and look forward to many more great nights.